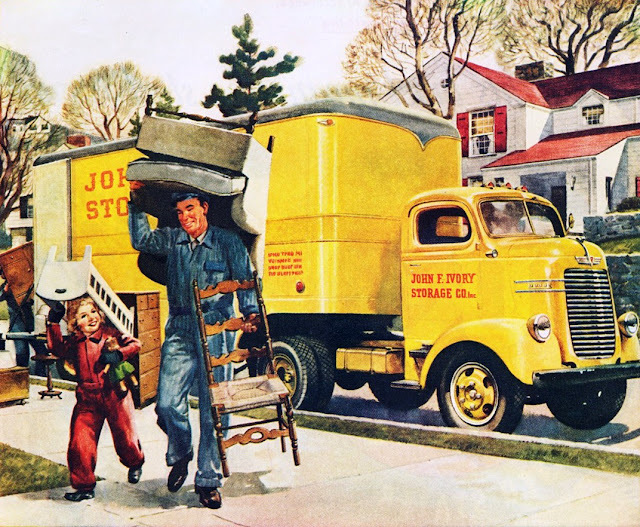 MID-CENTURIA : Art, Design and Decor from the Mid-Century and beyond: WE'RE MOVING! Welcome to Austin Kevin. You will enjoy it here. Thanks for the well wishes and referrals David!!!!! Good Luck with your move. We'll be waiting patiently for your next cool blog. I love your Blogs thanks for all of your great research. Enjoy the trip, but tell the guy in the picture he can keep the 'classics' he's carrying - no need to move those! Great blog, happy to see you post anything. Happy trails, Kevin. I think you and Austin will get along just fine. I am always appreciative of everything you post here. Bravo. Wishing you the best with your move. Austin sounds like the most incredible place to live. We were looking into it a year or so ago. I've been reading your blog for a few months, but this is my first time to reply. I adore getting your new blog updates in my in-box. It's pure eye candy! Can't wait for new posts, news and to hopefully to see your work. We know it will definitely be worth the wait - Good luck with the move. Hope everything goes well with the move! I will continue reading your page for sure. Greetings! Thanks again everyone!!!! your comments really mean a lot to me. Hey there Kevin - Welcome to Austin! Believe it or not their are some real mid-century treasures here. Enjoy!